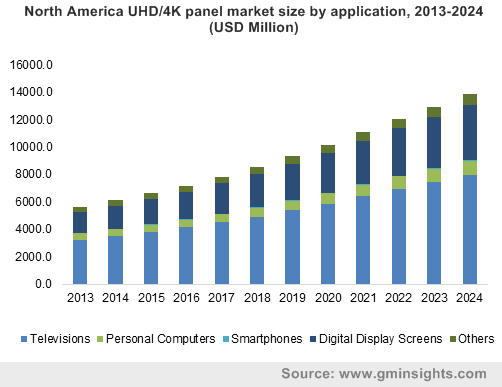 UHD/4K Panel Market size was over USD 16.5 billion in 2015, it is anticipated to grow at over 11% by 2024. Global volume will grow at more than 8%, to exceed 7.5 million units by 2024. Rapid technological advancements resulting in high resolution, improved brightness and extensive color gamut is anticipated to dive global UHD panel market growth over the forecast timeframe. Furthermore, these devices aid in enhancing the customer viewing experience. Rising efforts for the development of 8K technology that offers higher resolution when compared to 4K may spur product demand over the coming years. Increasing number of platforms offering UHD content is anticipated to instigate manufacturers to expand their offerings. Furthermore, estimated reduction in 4K panel market price trend may elevate product demand significantly over the coming years. Various benefits offered include low power consumption, better durability and light-weight. Favorable government initiatives such as reduced custom duties on imports in certain countries such as India and China may positively impact consumption. In addition, legal derivatives mandating manufacturers and content makers to comply with UHD Blu-ray standard for encouraging content creation is also expected to favourably impact growth through 2024. OLED segment accounted for over 40% of the overall volume in 2015 and is estimated to grow at 8.8% CAGR from 2016 to 2024. Growth in the segment can be attributed to increasing integration of these devices into mobile phones as well as tablets. LCD segment is forecast to hit nearly USD 18 billion by 2024. It uses the light modulating properties of liquid crystals. Low power consumption offered by these systems is expected to propel UHD panel market share over the forecast timeframe. These displays provide several benefits such as superior content quality. However, high cost associated with this product is likely to hamper 4K panel market share over the next eight years. Escalating integration across several applications such as TVs, personal computers, smartphones and laptops display screens is anticipated to offer potential growth avenues through 2024. Televisions dominated the industry, with more than 55% of the revenue generated in 2015; the segment is projected to grow at over 11% CAGR from 2016 to 2024. This may be attributed to increasing product use in television systems owing to rising demand for better picture quality in order to enhance customer viewing experience. Digital display screens were valued at over USD 4 billion in 2015. Growth in the segment stems from increasing demand for advertising, signage and publishing coupled with the widespread use of large UHD displays in digital applications such as music, sports events, and cinema complexes. Retail sector is also expected to pose considerable growth prospects in order to promote products and brands. These devices enable retailers to display their latest product offerings with clarity and details, which may help in captivating a larger consumer base. Changing customer preferences from large screens to enhanced resolution displays is forecast to fuel 4K panel market size from 2016 to 2024. The North American industry is anticipated to be valued at over USD 19 billion by 2024 due to attractive U.S. 4K panel market share. The region is marked by early technology adoption and considerable consumer base. Asia Pacific UHD panel market share accounted for over 20% of the industry 2015 and it is predicted to grow at 11.6% CAGR from 2016 to 2024. Presence of large number of OEM manufacturers across the region is likely to catapult industry growth over the next eight years. These products have gained rapid access in TV and digital signage, which comprises both non-residential and commercial applications. Digital signage market provides advertising, branding, information and entertainment to its target customers where the content can be remotely updated, controlled and managed. Increasing use of these displays in the commercial sector including government, hospitality and retail sectors is also expected to impel demand over the forecast timeline. Major industry participants in the UHD panel market share include Samsung Electronics, LG, Toshiba, Panasonic and Sony Electronics. Other prominent players are Sharp, Innolux, Haier, Philips, Hisense Group, BOE Technology Group, and AU Optronics. These devices provide potential benefits owing to high energy efficiency. In addition, longer components durability offered by these products is expected to further catalyze growth over the forecast timeframe This may be attributed to the non-requirement of any electronics or circuitry in these products. Industry participants focus on expanding their product portfolio with the provision of large-size display panels to keep with the ever increasing image quality demand. 60-inch or above screen size is anticipated to contribute significantly towards industry growth. These large panels provide better, thereby attracting a larger customer base. The value chain comprises raw material suppliers, component manufacturers, Original Equipment Manufacturers (OEMs), distributors and customers. Manufacturing these devices requires several electronics and display components. Raw materials required to manufacture these components include diodes, substrate, organic materials, display glass & polymers. A few key raw material suppliers include Aixtron AG, Densitron Display Solutions, Dupont, IPS Alpha Technology Ltd., SFA Engineering, SNU Precision, Universal Display Corporation, XMOS, AU Optronics, and Yurui Chemical Co. Ltd. Key components include TFT (thin film transistor) display and organic films, which are assemble by the OEMs. Manufacturers compete in order to deliver their high resolution services to a wider customer base. Several manufacturers distribute UHD displays in various sizes and they also have exploited the scope of this technology beyond residential applications. Industries such as broadcasting, animation, control rooms, government, CAM/CAD, engineering, photography, healthcare, and military are a few early technology adopters.